Heitor Villa-Lobos, born in Rio de Janeiro in 1887, has, by virtue of both his immense output and colourful and accessible musical language, become the most celebrated Brazilian composer of all time. His work not only richly typifies the diverse and kaleidoscopic Brazilian scene but also, in its abundance, originality, and vitality, provided the key which unlocked Brazilian art music once and for all from the shackles of European late-Romanticism. After the death of his father in 1899, Villa-Lobos, determined to escape the medical career planned for him by his mother, spent time playing (probably cello and guitar) in the ad hoc musical groups which performed and improvised in Rio’s cafes, on street corners, and at parties and weddings—the chôros. He then travelled in Brazil, absorbing musical influences from his country’s three main ethnic strands—Portuguese, African and Amerindian. This all resulted in the realization that the glorious aural amalgam which so impressed his soul was indeed the means by which concert music in Brazil would be revitalized and given a voice of its own. After much, sometimes eccentric, experimentation in orchestral and chamber compositions where traditional European traits lay side by side with quasi-Amerindian or African features, Villa-Lobos finally achieved his long sought-after new musical forms and language in the great series of Chôros (fourteen works, 1921–1929) in which the imitation of the music of true chôros was only one element. Villa-Lobos’s use of the word chôros as a generic title is broad-based: it implies spiritual concept, actual technique and form. The individual works in the series do not merely reproduce the sounds of improvised music-making, but rather attempt to use these as the starting point for an aural depiction of all aspects of Brazilian life. Urbane-type folk melody lies alongside material based on Amerindian modes and rhythms; imitation of jungle sound merges happily with the razzmatazz of modern city life. The spirit of chôros suffused all Villa-Lobos’s instrumental compositions from around 1920 until 1930, and many thereafter. After some success and much controversy as a composer in Brazil, Villa-Lobos made his way in 1923 to Paris, at that time the cultural centre of Europe, where every aspiring musician, artist and writer felt it obligatory at least to put in an appearance. The artistic ambience of Paris during the 1920s was particularly suitable for the acceptance and promotion of Villa-Lobos during his subsequent periods of residence there, until a final departure in 1930. Indeed, even before his own arrival several of his works were heard and applauded in the French capital, played by his compatriots or by European artists who had met the composer in Brazil. African music and jazz were particularly in vogue and the strange sounds of the music of the East so beloved by Debussy and Ravel still echoed loudly. The clear-cut, quixotic melodies of Milhaud and Poulenc were favoured, while Stravinsky’s rhythmic vitality affected everyone. Villa-Lobos’s highly coloured, strangely conceived, and rhythmically assured music thus found an ideal home in Paris during the 1920s. The composer Jean Wiener was one who had previously heard and admired some of Villa-Lobos’s music, and it was he who organized the first major Villa-Lobos concert out of Brazil which took place at the Salle des Agriculteurs in Paris on 9 April 1924. In addition to three Villa-Lobos works, compositions by Stravinsky, Wiener himself and Villa-Lobos’s old friend Milhaud were performed. The concert included the first performance of the 1921 Trio for oboe, clarinet and bassoon, considered by many Brazilian commentators to be the most important chamber work by the composer written to that date, consolidating as it did the chôros-like experimentation made in similarly scored works dating from 1916 onwards. 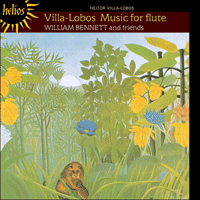 Always fascinated by the raw sounds of wind instruments, Villa-Lobos here indulged in harmonic clashes, rhythmic dexterity, and dynamic extremes, all charged with a particularly Brazilian ethos. Contrapuntal ingenuity is more than evident, especially in the final movement, reminding the listener that the Bachianas Brasileiras were even now struggling for birth. The contrapuntal nature of many passages in the Chôros series is clearly demonstrated in Chôros No 2, a duo for flute and clarinet written in 1924. This is one of only two compositions dating from that busy year of concert-giving and travel, the other being Chôros No 7, a larger chamber work which also employed flute and clarinet as leading voices. The spikily humorous dissonances, imitations, and syncopations of Chôros No 2 are all direct descendents of the improvisatory music of Rio’s street musicians in which the two instruments predominated. The work may also be seen as a genuine two-part invention, again prefiguring the conception of the later series of Bachianas Brasileiras. Villa-Lobos even made his own transcription of the work for piano. The contrapuntal ambience of much true chôros music and its reflection in Villa-Lobos’s concert music merely served to underline his thesis of Bachianas Brasileiras and provides the unifying common denominator between the two great series of works. What Villa-Lobos wished to achieve in the nine Bachianas Brasileiras (1930–1945) was a rarefied chôros, paying homage both to Brazilian life as he saw it and to the greatest of his European predecessors, Bach. Directly related to Chôros No 2 was Bachianas Brasileiras No 6, a duo for flute and bassoon written in 1938, the first movement of which even borrows the word chôro for its subtitle. The esoteric and recherché devices employed by Villa-Lobos in this work, however, set it apart from Chôros No 2, and in spirit it looks forward to the great classical fugue that forms Bachianas No 9, or even to the purity of the final string quartets. Bachianas No 6 was first published in 1946 in a special anthology of Brazilian music which gives a particularly succinct picture of the country’s musical diversity at that time. Upon return to Brazil, Villa-Lobos’s involvement with politics and educational music-making after the 1930 Getúlio Vargas coup meant that he was responsible for the organisation of a great many public ceremonies and events at which music was used to glorify the country’s achievements and aspirations and to stimulate a sense of unified nationhood. These activities reached their height in 1937. At one of the ceremonies in Rio de Janeiro that year, ostensibly celebrating the end of an academic period, a work for flute and guitar by Villa-Lobos, Motivos Gregos, was first performed, which here included optional chorus and ballet. It was eventually published as Distribuição de flores (‘Distribution of Flowers’) ‘based upon Greek motifs’. The short work evokes the same Greek antiquity in which Villa-Lobos had immersed himself during the composition of several early symphonic poems (1916), in turn stimulated by a love of classical myth instilled by his father. The fantasy piece for flute and cello, Assobio a Jato (‘The Jet Whistle’), was written in 1950 in New York and was first performed on 13 March 1950 in Rio de Janeiro. It is dedicated to Elizabeth and Carleton Sprague Smith (flautist and musicologist), and continues Villa-Lobos’s predilection, already seen in this recording, for writing high- and low-voiced instrumental duos. The piece is primarily a musical joke, playing on the natural characteristics of both instruments. Divided into three short movements, the colourfully lyrical, bustling world of the eclectic Villa-Lobos is encapsulated here in the fluid lines and virtuosity of both partners. In 1958 Villa-Lobos was asked to write the score for a Hollywood screen adaptation of W H Hudson’s South American novel Green Mansions. The MGM film was not successful, but Villa-Lobos’s music (only his second film score, written purely because the story was of his beloved forests and jungles) lived on in the form of a suite which includes a love-song, Canção do Amor, available in versions for voice and guitar or voice and orchestra. The first performance of this song in concert form was given at the Empire State Music Festival on 12 July 1959, the last concert that Villa-Lobos conducted before his death four months later. It is written in the manner of the old Brazilian serenade, seresta, and is recorded here in a transcription for flute and guitar. From the many examples of the Brazilian Modinha provided by Villa-Lobos, that recorded here, for flute and guitar, is a transcription of a song from the set entitled Serestas for voice and piano, and was written in Rio de Janeiro in 1926. The modinha was a sentimental type of love-song popular in the eighteenth and nineteenth centuries, characterised by melancholy, sequential, and syncopated melody usually in the minor mode, with simple accompaniment. The text of the original song speaks of unrequited but never-ending love, and is set with typically Brazilian anguish and longing. Né à Rio de Janeiro en 1887, Heitor Villa-Lobos est devenu, grâce à son œuvre immense, au langage coloré et accessible, le plus célèbre compositeur brésilien de tous les temps. Son œuvre ne fit pas que symboliser richement le paysage pluriel et kaléidoscopique brésilien: il fut, de par son abondance, son originalité et sa vitalité, la clef qui libéra une fois pour toutes la musique savante brésilienne des entraves du romantisme tardif européen. Après la mort de son père, en 1899, Villa-Lobos résolut d’échapper à la carrière médicale à laquelle sa mère le destinait, joua pendant quelque temps (probablement du violoncelle et de la guitare) dans les groupes musicaux qui se produisaient et improvisaient dans les cafés de Rio, au coin des rues, lors des fêtes et des mariages—les chôros. Puis il parcourut le Brésil, absorbant les influences musicales des trois grands courants ethniques du pays (portugais, africain et amérindien) jusqu’à comprendre que le superbe amalgame sonore qui impressionnait tant son âme était en fait le moyen de revitaliser la musique de concert brésilienne, de lui donner une voix bien à elle. Après de nombreux essais, parfois excentriques, de compositions orchestrales et de musiques de chambre mêlant caractéristiques européennes traditionnelles et traits quasi amérindiens ou africains, Villa-Lobos trouva enfin, avec la grande série des Chôros (quatorze œuvres, 1921–1929)—où l’imitation de la musique des véritables chôros ne fut qu’un élément parmi d’autres—, les formes et le langage nouveaux auxquels il aspirait depuis si longtemps. L’usage du mot chôros comme titre générique est large, qui sous-entend un concept spirituel, une réelle technique et une forme. Chaque pièce de la série ne se contente pas de reproduire les sonorités de la musique improvisée, mais tente plutôt d’en faire le point de départ d’un tableau sonore de tous les aspects de la vie brésilienne. La mélodie populaire urbaine côtoie un matériau fondé sur les modes et les rythmes amérindiens; l’imitation des sons de la jungle se fond avec bonheur au clinquant de la vie citadine moderne. L’esprit des chôros imprègne toutes les œuvres instrumentales de Villa-Lobos composées de 1920 environ à 1930, ainsi que de nombreuses pièces ultérieures. En 1923, après avoir rencontré quelque succès et suscité force controverses en tant que compositeur, au Brésil, Villa-Lobos partit pour Paris, alors centre culturel de l’Europe, où tout aspirant musicien, artiste ou écrivain se sentait le devoir de faire au moins une apparition. L’ambiance artistique du Paris des années 1920 fut particulièrement favorable à Villa-Lobos, qui séjourna à différentes reprises dans la capitale avant de la quitter définitivement en 1930. En réalité, plusieurs de ses œuvres avaient été entendues et applaudies à Paris avant même son arrivée, jouées par des compatriotes ou par des artistes européens qui l’avaient rencontré au Brésil. La musique africaine et le jazz étaient alors particulièrement en vogue, tandis que les étranges sonorités de la musique orientale si chère à Debussy et à Ravel trouvaient encore un fort écho. Les mélodies claires, généreuses, de Milhaud et de Poulenc étaient goûtées, et la vitalité rythmique de Stravinsky touchait tout un chacun. Le Paris des années 20 fut donc un berceau idéal pour la musique de Villa-Lobos, haute en couleurs, étrangement conçue, aux rythmes affirmés. Le compositeur Jean Wiéner, qui avait déjà entendu et admiré certaines de ces musiques, organisa le premier grand concert consacré à Villa-Lobos en dehors du Brésil, à la salle des agriculteurs, à Paris, le 9 avril 1924. Outre trois œuvres de Villa-Lobos, on joua des compositions de Stravinsky, de Wiéner lui-même, et de Milhaud, vieil ami de Villa-Lobos. Ce concert vit la création du Trio pour hautbois, clarinette et basson (1921), considéré par maints commentateurs brésiliens comme la plus importante œuvre de chambre composée jusqu’alors par Villa-Lobos, car il consolida l’expérience de type chôros menée dans des pièces dévolues aux mêmes instruments et écrites à partir de 1916. Toujours fasciné par les sonorités brutes des vents, Villa-Lobos s’adonna, dans ce Trio, à des frictions harmoniques, à une dextérité rythmique et à des extrêmes dynamiques, tous chargés d’un éthos singulièrement brésilien. L’ingéniosité contrapuntique est plus qu’évidente, surtout dans le dernier mouvement, qui rappelle à l’auditeur que les Bachianas Brasileiras agitaient déjà l’esprit du compositeur. La nature contrapuntique de nombreux passages, dans la série des Chôros, ressort clairement dans le Chôros n°2, un duo pour flûte et clarinette écrit en 1924. En cette bouillonnante année de concerts et de voyages, Villa-Lobos ne composa que cette pièce et le Chôros n°7, œuvre de chambre plus vaste ayant, elle aussi, la flûte et la clarinette pour voix principales. Les dissonances à l’humour acerbe, les imitations et les syncopes du Chôros n°2 sont toutes les descendantes directes des improvisations des musiciens de rues de Rio, où flûte et clarinette prédominaient. L’on peut également voir cette œuvre comme une authentique invention à deux parties, préfigurant de nouveau la conception de la série des Bachianas Brasileiras. Villa-Lobos transcrivit même cette pièce pour piano. L’ambiance contrapuntique de la très authentique musique de chôros, qui se reflète dans la musique de concert de Villa-Lobos, sert simplement à souligner la thèse développée par le compositeur dans ses Bachianas Brasileiras et constitue le dénominateur commun, unificateur, de ces deux deux grandes séries d’œuvres. Dans les neuf Bachianas Brasileiras (1930–1945), Villa-Lobos voulut réaliser un chôros épuré, double hommage à la vie brésilienne telle qu’il la voyait et à son plus grand prédécesseur européen, Bach. Le Bachianas Brasileiras n°6, un duo pour flûte et basson écrit en 1938, dont le premier mouvement est même sous-titré chôros, se rattachent directement au Chôros n°2, dont elles se distinguent toutefois par leurs procédés ésotériques et recherchés—leur esprit regardant plutôt vers la grande fugue classique constitutive de Bachianas n°9, voire vers la pureté des derniers quatuors à cordes. Le Bachianas n°6 parurent pour la première fois en 1946, dans une anthologie de musique brésilienne brossant un tableau particulièrement concis de la diversité musicale du Brésil de l’époque. À son retour au Brésil, après le coup d’État de Getúlio Vargas (1930), Villa-Lobos participa à la politique et à l’éducation musicale et fut, de ce fait, responsable d’un très grand nombre de cérémonies et d’événements publics, au cours desquels la musique servait tant à glorifier les réalisations et les aspirations du pays qu’à stimuler le sentiment d’une nation unifiée. Ces activités culminèrent en 1937. Cette année-là, à l’occasion d’une cérémonie organisée à Rio de Janeiro pour célébrer ostensiblement la fin d’une session universitaire, Motivos gregos—œuvre pour flûte et guitare, avec chœur et ballet facultatifs—de Villa-Lobos fut créée. Elle fut finalement publiée sous le titre Distribuição de flores («Distribution de fleurs»), «fondée sur des motifs grecs». Cette pièce brève évoque cette antiquité grecque dans laquelle Villa-Lobos s’était déjà plongé pour composer plusieurs poèmes symphoniques de jeunesse (1916), stimulé par l’amour des mythes classiques que lui avait inculqué son père. La fantaisie pour flûte et violoncelle, Assobio a Jato («Le flûtiau de jais»), écrite à New York en 1950 et créée à Rio de Janeiro le 13 mars de la même année, est dédiée à Elizabeth et Carleton Sprague Smith (flûtiste et musicologue). Reprenant la prédilection de Villa-Lobos pour les duos instrumentaux destinés à des voix aiguë et grave, cette pièce est avant tout une plaisanterie musicale, qui joue sur les caractéristiques naturelles des deux instruments. Scindé en trois courts mouvements, l’univers vivement lyrique, grouillant, de l’éclectique Villa-Lobos se trouve enchâssé dans les lignes fluides et la virtuosité des deux partenaires. En 1958, Villa-Lobos se vit commander par Hollywood une musique pour l’adaptation cinématographique du roman sud-américain de W H Hudson Green Mansions. Le film de la MGM ne fut pas un succès, mais la musique de Villa-Lobos (sa deuxième musique de film, écrite juste parce que l’histoire parlait de ses forêts et jungles bien-aimées) perdura sous la forme d’une Suite incluant une chanson d’amour, Canção do Amor, pour voix et guitare ou pour voix et orchestre. Cette chanson fut créée, en concert, lors de l’Empire State Music Festival, le 12 juillet 1959 (ce concert fut le dernier que Villa-Lobos dirigea, quatre mois avant de mourir). Cette song, écrite à la manière d’une vieille sérénade brésilienne (seresta), est enregistrée ici dans une transcription pour flûte et guitare. Heitor Villa-Lobos, 1887 in Rio de Janeiro geboren, ist sowohl auf Grund seines umfangreichen Schaffens als auch durch seine farbenfrohe, eingängige Musik zum berühmtesten brasilianischen Komponisten aller Zeiten geworden. Sein Oeuvre stellt nicht nur bildhaft das Kolorit und die kaleidoskopische Vielfalt Brasiliens dar, sondern lieferte mit seiner Fülle, Originalität und Vitalität auch den Schlüssel, der die brasilianische Kunstmusik ein für allemal von den Fesseln der europäischen Spätromantik befreit hat. Nach dem Tod seines Vaters im Jahre 1899 war Villa-Lobos entschlossen, der Medizinerlaufbahn zu entgehen, die seine Mutter für ihn vorgesehen hatte, und verbrachte seine Zeit zunächst damit, daß er (wahrscheinlich als Cellist und Gitarrist) in den ad hoc zusammengestellten Musikgruppen—den chôros—spielte, die in den Cafés, an Straßenecken und bei den Festen und Hochzeiten der Stadt Rio auftraten und improvisierten. Anschließend bereiste er Brasilien und machte sich mit den musikalischen Einflüssen der drei wesentlichen ethnischen Gruppen seiner Heimat vertraut—der Portugiesen, Afrikaner und indianischen Ureinwohner. All dies führte ihn zu der Erkenntnis, daß das großartige akustische Gemisch, das seine Seele so tief berührte, wahrhaftig das geeignete Mittel war, um die brasilianische Konzertmusik neu zu beleben und ihr eine eigene Stimme zu verleihen. Nach vielen, teils exzentrischen Experimenten mit Orchester- und Kammermusikkompositionen, die europäische Merkmale neben quasi-indianische und afrikanische stellten, gelang Villa-Lobos der Durchbruch zu den lang erstrebten neuen musikalischen Ausdrucksformen mit der großen Serie der Chôros (vierzehn Werke, 1921–1929), in denen die Nachahmung der Musik der echten chôros nur ein Element von vielen war. Villa-Lobos’ Verwendung von chôros als Oberbegriff ist vieldeutig: Er läßt auf ein spirituelles Konzept, eine bestimmte Technik und Form schließen. Die einzelnen Werke der Serie geben nicht bloß die Klänge improvisierten Musizierens wieder, sondern versuchen diese als Ausgangspunkt für eine akustische Darstellung aller Aspekte brasilianischen Lebens zu nutzen. Weltläufig gewitzte Volksweisen stehen neben Material, das auf indianischen Tonarten und Rhythmen beruht; die Nach­ahmung von Dschungelgeräuschen verschmilzt ohne weiteres mit dem Trubel des modernen Stadtlebens. Der Geist der chôros durchzieht alle Instrumentalkompositionen, die Villa-Lobos etwa ab 1920 bis 1930 schuf, und auch noch viele danach. Nach einigen Erfolgen und zahlreichen Kontroversen, denen er als Komponist in seiner brasilianischen Heimat ausgesetzt war, reiste Villa-Lobos 1923 nach Paris. Die Stadt war damals das kulturelle Zentrum Europas—jeder aufstrebene Musiker, Maler und Schriftsteller meinte, sich dort zumindest vorübergehend einfinden zu müssen. Das künstlerische Ambiente im Paris der 20er Jahre erwies sich für die Anerkennung und Förderung von Villa-Lobos als besonders günstig, bis er nach mehreren Aufenthalten die Stadt 1930 endgültig verließ. Schon vor seiner Ankunft wurden seine Werke in der französischen Hauptstadt aufgeführt und mit Beifall aufgenommen, gespielt von seinen Landsleuten oder von europäischen Musikern, die den Komponisten in Brasilien kennengelernt hatten. Afrikanische Musik und Jazz waren damals besonders en vogue, und die fremdartigen Klänge der fernöstlichen Musik, die Debussy und Ravel so liebten, hallten immer noch vernehmlich nach. Die klaren, idealisierten Melodien von Milhaud und Poulenc fanden Zuspruch, und Strawinskis rhythmische Vitalität zeitigte bei allen ihre Wirkung. Die farbenfrohe, ungewohnt konzipierte und rhythmisch forsche Musik von Villa-Lobos fand darum im Paris der 20er Jahre eine ideale Heimat. Der Komponist Jean Wiener war einer von jenen, die Villa-Lobos’ Musik schon zuvor gehört und bewundert hatten, und er war es auch, der am 9. April 1924 im Pariser Salle des Agriculteurs das erste maßgebliche Villa-Lobos-Konzert außerhalb Brasiliens organisierte. Neben drei Werken von Villa-Lobos spielte man Kompositionen von Strawinski, von Wiener selbst und von Villa-Lobos’ altem Freund Milhaud. Der kontrapunktische Charakter vieler Passagen der Chôros-Serie zeigt sich eindeutig in Chôros Nr. 2, einem 1924 entstandenen Duo für Flöte und Klarinette. Es handelt sich um eine vor nur zwei Kompositionen aus jenem Jahr, das mit Konzerten und Reisen ausgefüllt war—das andere ist Chôros Nr. 7, ein umfangreicheres Kammermusikwerk, das ebenfalls Flöte und Klarinette als führende Stimmen einsetzt. Die aufsässig humorvollen Dissonanzen, Imitationen und Synkopen der Chôros Nr. 2 stammen alle direkt von der improvisierten Musik der Straßenmusikanten Rios ab, in der beide Instrumente vorherrschten. Zugleich ist das Werk als echte zweistimmige Invention anzusehen, die wiederum auf die Idee hinter der später entstandenen Serie der Bachianas Brasileiras vorausweist. Villa-Lobos hat das Stück sogar selbst für Klavier transkribiert. Das kontrapunktische Ambiente eines großen Teils der echten chôros-Musik und deren Niederschlag in Villa-Lobos’ Konzertmusik dienten lediglich als Bestätigung seiner in den Bachianas Brasileiras vertretenen These und ergeben den vereinheitlichenden gemeinsamen Nenner der beiden bedeutenden Werkreihen. Was Villa-Lobos mit den neun Bachianas Brasileiras (1930–1945) erreichen wollte, war eine Art verfeinerter chôros, eine Huldigung sowohl des brasilianischen Alltags, wie er ihn sah, als auch des größten seiner europäischen Vorgänger, Johann Sebastian Bach. Direkt mit Chôros Nr. 2 verwandt ist Bachianas Brasileiras Nr. 6, ein Duo für Flöte und Fagott aus dem Jahr 1938, das sogar das Wort chôro als Untertitel benutzt. Die esoterischen, ausgefallenen Mittel, die Villa-Lobos in diesem Werk einsetzt, unterscheiden es jedoch von Chôros Nr. 2, und im Geiste blickt es voraus auf die große klassische Fuge von Bachianas Nr. 9 bzw. auf die Reinheit der letzten Streichquartette. Bachianas Nr. 6 wurde erstmals 1946 in einer speziellen Anthologie brasilianischer Musik veröffentlicht, die ein besonders prägnantes Bild von der musikalischen Vielfalt des Landes zum damaligen Zeitpunkt bietet. Als er nach Brasilien zurückgekehrt war, bedeutete Villa-Lobos’ Engagement in der Politik und Musikerziehung nach dem Staatsstreich von Getúlio Vargas im Jahre 1930, daß er für die Organisation zahlreicher öffentlicher Zeremonien und Veranstaltungen verantwortlich war. Dabei wurde Musik benutzt, um die Errungenschaften und Bestrebungen des Landes zu verherrlichen und ein Gefühl nationaler Einheit hervorzurufen. Diese Ereignisse erreichten 1937 ihren Höhepunkt. Bei einer Zeremonie, mit der man in Rio de Janeiro in jenem Jahr offiziell das Ende eines Schuljahrs beging, wurde ein Werk von Villa-Lobos mit dem Titel Motivos Gregos uraufgeführt, damals einschließlich Chor und Ballett. Veröffentlicht wurde das Werk schließlich als Distribuição de flores („Blumenstreuen“) „nach griechischen Motiven“. Das kurze Werk beschwört die griechische Antike herauf, mit der sich Villa-Lobos 1916 während der Arbeit an mehreren frühen sinfonischen Dichtungen intensiv beschäftigt hatte; dazu angeregt hatte ihn eine Vorliebe für die Mythen des klassischen Altertums, die ihm sein Vater vermittelt hatte. Das Fantasiestück für Flöte und Cello Assobio a Jato („Der Strahl Pfeifen“) wurde 1950 in New York geschrieben und am 13. März 1950 in Rio de Janeiro uraufgeführt. Es ist Elizabeth und Carleton Sprague Smith (dem Flötisten und Musikwissenschaftler) gewidmet und ist ein weiteres Beispiel von Villa-Lobos’ Vorliebe für das Komponieren von Duos für hohe und tiefe Instrumente, wie sie in der vorliegenden Aufnahme bereits deutlich hervorgehoben wurde. Das Stück ist in erster Linie ein musikalischer Scherz, der sich auf die naturgegebenen Eigenschaften der beiden Instrumente bezieht. Aufgeteilt in drei kurze Sätze, fängt das Werk in den fließenden Melodielinien und der Virtuosität beider Partner die farbenfroh lyrische, geschäftige Welt des Eklektikers Villa-Lobos ein. Im Jahre 1958 wurde Villa-Lobos gebeten, die Filmmusik für die Hollywood-Version von W H Hudsons Südamerika-Roman Green Mansions („Tropenglut“) zu komponieren. Der MGM-Film war kein Erfolg, doch Villa-Lobos’ Musik (erst seine zweite Filmmusik, die er nur deswegen übernahm, weil es um seine geliebten Wälder und Dschungel ging) blieb in Form einer Suite unter anderem mit dem Liebeslied Canção do Amor erhalten, das in Versionen für Gesang mit Gitarren- oder Orchesterbegleitung vorliegt. Die Uraufführung des Liedes in seiner Konzertfassung fand am 12. Juli 1959 beim Empire State Music Festival statt, dem letzten Konzert, das Villa-Lobos vor seinem Tod vier Monate später geleitet hat. Es ist in der Manier der altbrasilianischen Serenade oder seresta gehalten und wurde hier in einer Transkription für Flöte und Gitarre eingespielt.